First and foremost his "mission of peace" has absolutely nothing to do with actual peace. In fact, when speaking of the beast in Rome it states clearly in Daniel 8:25, "And through his policy also he shall cause craft to prosper in his hand; and he shall magnify himself in his heart, and by peace shall destroy many: he shall also stand up against the Prince of princes; but he shall be broken without hand." Every Pope of the Roman Catholic church, and especially a Jesuit Pope who took an oath to kill innocent people in the most violent manner imaginable simply because they're not "Catholic" are in fact, hands down the most evil men ever to breathe air on planet earth with one exception; that being of course Judas Iscariot who betrayed our Lord. I have over 12,000 pages of prophecies on my website filled with present day and historic facts, mass killings, pictures embracing violent religions, Vatican doc files, bold worship of Satan and videos on a plethora of topics exposing the Popes as being the prophesied man of sin to confirm that as fact. The man of sin is a liar and his dying god is the father of lies. When he says "peace" he really means war as any competent and well-educated historian will tell you. The very fact he does not plan to skip the trip to Egypt confirms that hands down. 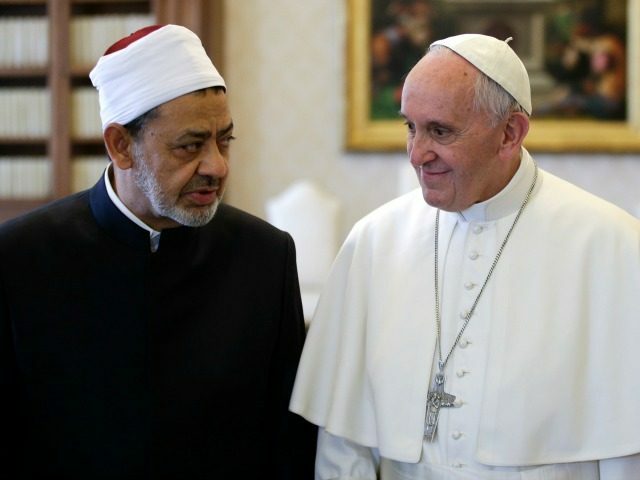 Common sense dictates that Pope fears no Muslim in Egypt. Historic and modern day reality shows he has been at the forefront of helping them politically strengthen worldwide by peppering every nation on earth with Muslims in his so called immigration efforts. If it was truly about fearful immigrants running from war-torn nations to see refuge on safe soil, then why is it every time we see hordes of Muslims spilling into any given nation, (like this picture) we see absolutely no women and children? Did they forget about mom, sis, daughter and spouse? No, they left them behind because the Vatican controlled media lied about how bad it is in their nations so as to have the excuse to open the floodgates for refuges. In other words, they are not immigrants at all. They're soldiers of Rome. The fact they openly salute the Pope on camera just as their Nazi predecessors did solidifies that as a basic reality as well. And so this is why the Pope has no fear walking into Egypt. It is also why he will use this fabricated "courage" to declare he is a man protected by God and all the well indoctrinated Catholics and their Protestant brethren from the Baptist to the SDA will belief him hook, line and scepter. He has no fear to walk into Egypt because he has nothing but friends there and they know how valuable he is to their global agenda. Worse yet, he knows they know that and he also has plans for them as well. Rome has been known since their beginning to use "friends" as pawns so as to either meld them into their number or kill them off to prevent crippling their agenda. The Muslims are in for one very shocking awakening. (You would have thought they learned their lessons when the Pope of Rome reneged on their deal in 1095AD ago that brought on the crusades.) The man of sin can no more change his hell inspired agenda than can a leopard change its spots. Just as the scorpion on the back of the turtle, the devil is as the devil does. It's just his nature.